Attention cable lovers! 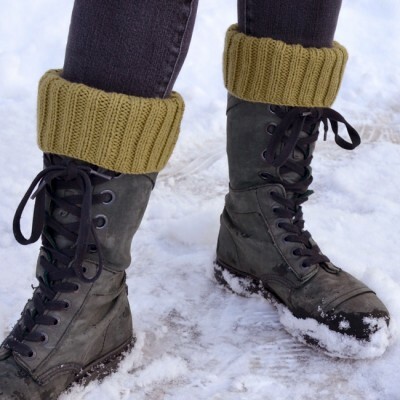 Step up your cold weather style with Entangled Boot Cuffs. With their longer length, Entangled Boot Cuffs work well with a variety of boots – from ankle to knee-high. Wear these versatile boot cuffs four ways: Cables up, cables cuffed over, ribbing up, or ribbing cuffed over. One pair of cuffs – four different looks! Cuffs fit calf sizes of approx 11.5, 12.75, 14, 15.25, 16.5” (29, 32.5, 35.5, 38.5, 42 cm) circumference. Overall boot cuff length approx 9.5” (24 cm). For your reference when picking a size to work, our model is wearing the 14” (35.5 cm) size. Her actual calf circumference with leg coverings is 14” (35.5 cm). Carefully measure your calf to calculate what size cuff to work. Measure over the type or weight of leg covering (tights/pants) that you will likely be wearing with the cuffs. Take into consideration the thickness of a boot layer if you will be folding your cuffs over a boot top. Also, keep in mind that this cable pattern looks its best when it is not overly stretched. If the fit is too tight, the twists will become distorted. Always work a small sample to try on for size before completing an entire cuff. 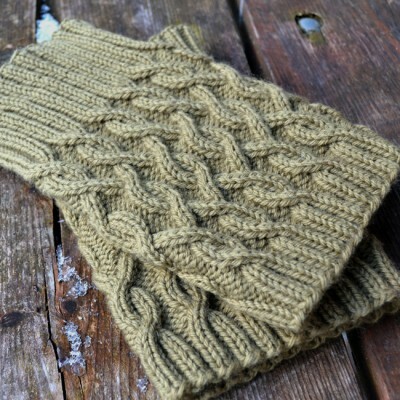 The cable pattern stitches are charted, but the pattern includes complete written directions so the ability to read a chart is not necessary to work this pattern. Using larger-sized needles, 31 stitches/32 rounds to 4” x 4” (10 cm x 10 cm) in cable pattern stitch, unblocked. Cuffs are worked in the round from the narrow ribbing down. A combination of 2×2 rib and cables add visual interest and stability. 211 – 305 yards (193 – 279 m) of worsted weight yarn. A yarn with good stitch definition and little to no halo is recommended. Solid colors are recommended. Slight tonals will work, but variegated yarn will distract from the cable stitch pattern. Due to the nature of this type of accessory, a sturdy yarn with excellent elasticity is recommended.